The Government wants more Canberrans to swap cars for the bus, light rail, or bike. File photo. The ACT Government will target private car owners in a bid to reverse rising greenhouse gas emissions in the transport sector, with private car use the biggest contributor. Overall the ACT’s greenhouse gas emissions continue to fall, as more of the Territory’s electricity comes from renewable sources. But the transport sector stands apart as the next big challenge for the Government. The ACT’s 2017-18 Greenhouse Gas Inventory report found that the ACT’s emissions fell 14 per cent over the year, but transport emissions rose 2.3 per cent on 2016-17 levels and now accounts for 34 per cent of all emissions. 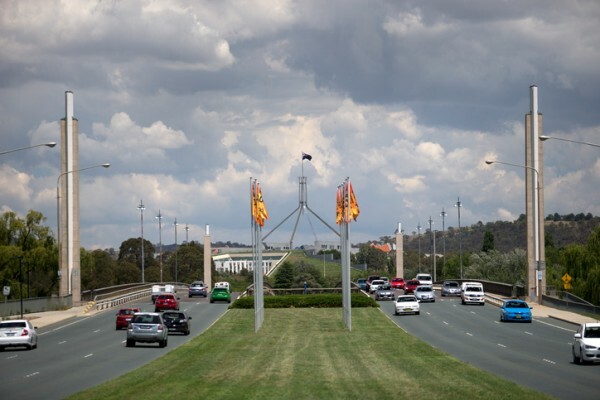 By 2020, when the ACT will be powered by 100 per cent renewable electricity, transport will be Canberra’s biggest source of greenhouse gas emissions, at more than 60 per cent. Minister for Climate Change and Sustainability Shane Rattenbury said the Government would be encouraging car users to consider other ways of getting around the city. “The Government will focus on helping people to take sustainable modes of transport, like light rail, buses and active transport. We’re also looking to the community to work with us, to being open to trying new ways of moving around the city,” he said. The Government is also encouraging the take-up of electric vehicles, with new charge points, and the transition of the Government fleet to ‘clean’ cars. Mr Rattenbury said the other challenge was reducing reliance on natural gas, and eventually phasing out its use altogether. Natural gas emissions decreased by 4 per cent on 2016-17 levels, but it is still a major source of heating for many Canberrans. “Natural gas emissions are already reducing, partly due to people switching to new highly efficient electric appliances for their home heating and cooking,” he said. The report found a big drop in waste emissions, down 31 per cent from 2016-17, mainly due to an increase in the volume of landfill gas captured and burnt. Electricity emissions fell 27 per cent on 2016-17 levels. “The report shows the ACT continues to make great progress in reducing our greenhouse gas emissions. Renewable electricity generation grew from 30 per cent to 49 per cent in 2017-18 as more of our wind farms came online,” Minister Rattenbury said. He said the report showed that, with strong community support, the ACT can meet its emission goals. The 2017-18 Greenhouse Gas Inventory is available at www.environment.act.gov.au. Why take public transport in this city when a 15min car trip equals to a 45min -hour bus trip and 2 buses? I think I know which one I would take, even with paid parking. The public transport in this city is ridiculous. -Have less connections, less waiting time in-between buses if route must have a connection, more regular buses, everywhere not just the Rapids that finish at the malls, more bus routes so they don’t have to weave around as much, even more free/cheap parking near interchanges would help (then you don’t have to travel 5 mins by bus only to be forced off to wait another 15 mins or more for next bus) and make the bus trip closer to 20-30mins in length to help it match more closely to a 15 min car trip, then I may reconsider. Since my Combined Community Council Transport working Group made a submission to Government on Network14, and even longer, nothing has changed. One of the recommendations we made was to work with Resident Associations, Community Councils etc and Govt to meet with specific catchments to identify those factors which would convince Joe Public to mode shift. Currently, for at least the past 29 years it JUST TAKES TOO LONG to get anywhere. Get a commitment from residents to mode shift if government provide DIRECT ROUTES and you may get there. Until that happens, it will be more of the same. When I put the “joke” to Transport Staff-“what is the longest distance between two points-an ACTION bus service” they all laughed. They do not get it, even now, and despite Simon Corbell saying he wanted to compete with the car-nothing has changed. So Canberrans-let’s get the government to meet with us and tell them what we want. In fact, let’s make it an election issue as they won’t have resolved the issue by then anyway. That’s nice, but there’s no public transport links to my place of work and my wage isn’t growing proportionate to cost of living increases, so I can’t afford a bike (let alone the time commitment). If you can’t afford a bike then you certainly couldn’t afford a car (let alone the time commitment). Couple of issues with this proposition by the Barr Government. Firstly they state “The Government will focus on helping people to take sustainable modes of transport, like light rail, buses and active transport”. Well this is not true as they’ve cut many bus services and many more cuts yet to come. I would gladly catch a bus each day if we actually had a decent system in Canberra. It takes me 15 minutes to drive to work. Catching a bus takes a minimum of an hour. I think that point is a major issue for many Canberrans. Secondly Canberra has a lot of interstate drivers. Targeting what I assume will be ACT registered vehicles is unfair because it doesn’t address the issue of emissions made by the many interstate drivers that live and visit Canberra and all equally contribute to the issue. The NBN contractors are doing suburbs in Tuggeranong now and I note all their vehicles are NSW registered as are a lot of vehicles doing work in Molonglo roadworks and all over Canberra for that matter. Large trucks involved in waste and recycling are also registered interstate despite them being operated exclusively in the ACT. These are the vehicles that knock the crap out of our roads but they pay nothing in return. Another police cop-out (pun intended). Actually the government isn’t cutting bus services. They are reorganising the routes to make the quicker and more often, which in this town is the only viable way to make a decent bus service. The new timetable has 30 extra buses operating it. Which bus service/s will you be using now, JC? That's all very nice but I'm not going to spend 8 hours a week commuting. Put in efficient fast transport first. Same here.. Life is precious.. Work commutes can really add up fast to lost life and eroded relationships and health..
Why are so many people here talking about taking kids to schhol? When I was a kid i took myself. Walked to the bus and that when to my school. I had no issues. People do more than go to and from work. Want to go down the coast for the weekend, maybe surfing or camping you not going to catch a bus. In Canberra THE CAR IS KING. Will be for the next hundred years. Let’s hope that electric vehicles become very affordable (for people who have to buy and maintain a car from their own pocket, not from the ratepayers’ pockets) very quickly, because in the meantime, this campaign against vehicle emissions will be just another revenging-gouging jihad by the ACT Government against private vehicles. If the Government truly wants to encourage “active transport” it should take a hard look at the sort of streetscapes which its planning rules are encouraging and allowing. Take, for example, a walk from the soon-to-be Civic tram terminus to the New Acton precinct. On days when the weather is less than idyllic (we do have them in Canberra), it’s quite bleak and harsh, with limited cover and not particularly accommodating to people with mobility issues – which might explain why most visitors to that area do it by car, and park as close as possible. It’s much the same throughout most of Canberra. Some very defensive posts here. It appears that, possibly due to a pretty silly headline for this article “Private car users in ACT Government sights…” there may have been a lot of knee-jerk reactions. The point wasn’t about banning private motor vehicle use but encouraging alternative forms of transport so that only those who need to use a PMV are on the road. This means 1) more space on the road, less congestion, less rear-ending due to frayed nerves. 2) more parking available without turning the entire city into a giant car park 3) healthier people, lower health budget costs, more available hospital beds, and 4) lower transport costs. According to the NRMA the average motor car trip is less than 8 kms so there’s a lot to work from there. That’s me, and about three quarters of the rest of Canberra. This makes any support for your argument futile. no it doesn’t actually. You can own a car without having to make every trip around canberra in the car. Plenty of people do. I won’t make up a percentage as you have however it’s pretty clear plenty of people cycling. walking and catching a bus to work make the argument valid. Really!? The public transport network is, in most cases unsuitable for commuting to and from work. Or can you not read and absorb information? The problems with the public transport system make it the main thing causing people to HAVE to use a car to get to the child care centre (OR the school’s one ) and /or to school and then to work. And back again. Witless support for a government with a responsible (?) Minister who just hate’s cars, isn’t going to cut it with most folk, in this town. IF this Labour/Green coalition had done anything effective to ensure all housing built for the last two decades were truly energy efficient I’d take them seriously, but they have not.
? the two big factors are i) orientation so that the dwelling gains heat on cold days and doesn’t gain a lot of heat on HOT days. ii) energy efficient construction. Neither have been effectively implemented. I began to seriously study and engage with energy efficiency, in the 1970s. Simply wanting stuff to change out of concern isn’t engagement, nor is it understanding. That was a Lake George post, so shallow it’s dry. Yep there’s some very defensive posts alright. I’m not sure whether you’re trying to discuss energy efficiency in buildings, the use of private motor vehicles or just that you don’t like the current ACT Government. https://theconversation.com/why-trackless-trams-are-ready-to-replace-light-rail-103690 ACT Government - this would mean no more removal of trees and wouldn't wreak havoc with the Heritage values of the city - and costs 1/10th of tracked light rail. No excuse not to do better in the ACT. The Liberals are incapable of developing a “counter position” and the media (CT and ABC) won’t give them the time of day to promulgate it. Being a bit harsh on the media there. They do publish the shrill that comes from the Libs. And I have no doubt they would publish a policy position from them if they had one. Or... increase the uptake of EV's through government rebates. But it's not about emissions is it... it's about money. So I'm supposed to get 60 to 80 litres of paint, ladders and tools on a bus??? You want us to leave the car at home and walk the kids to school, what time do you start work 11.30a.m. to finish at 2p.m. to reverse the schedule? This local government needs to step into the shoes of a regular Australian and wake up! You are just making yourself look silly. You know it's not about work vehicles. You just had to make a point that you have to know was wrong. So, what is your reason for this? Julie is right. There are many of us for whom it's impossible or impractical to use the bus or whathaveyou. But there are also those amongst who likely could handle using public transport more often than we do, if they/we are not dealing with large equipment, school times, etc, etc. The one bus service I might use, the xpresso, is going to be axed so I doubt I’ll be using the buses regularly. Thunderstorms offset emissions too . All the ACT goverment officials should take public transport for a month and see if they think it's working. Get angry or vote act liberals. Light rail? You mean the Gungahlin train? It doesn’t service the rest of Canberra.